You may want to discuss with your students the different types of adaptations that the different desert plants shown here demonstrate. The cacti lack leaves to avoid water loss, and the light-colored spines of the cholla help reflect sunlight and prevent overheating. In addition, the saguaros are able to store large amounts of water in their massive trunks. The creosote bush has tiny leaves that can be dropped during droughts (also to prevent water loss) and regrown soon after rains. 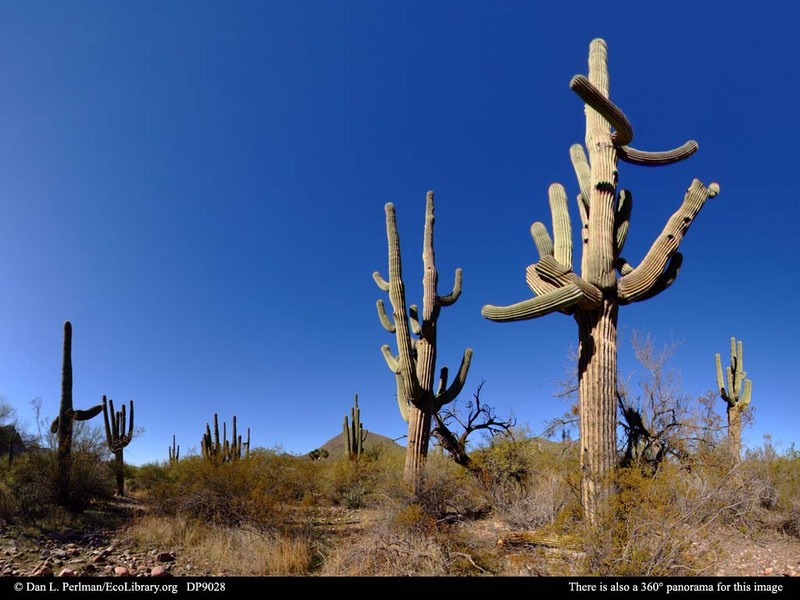 Despite the harsh conditions, these plants can have very long lives, with saguaros living over 300 years, and some creosote bushes living for thousands of years. The dominant plant visible in this image of the Sonoran Desert is the saguaro cactus (Carnegiea gigantea), which can live to be over 200 years old and can reach 50ft (about 15m) in height and 10 tons (9,000kg) in weight. Saguaros -- the archtypal desert plant -- are actually only found in the Sonoran Desert, which straddles the US/Mexico border. Other notable plants here include the creosote bush (Larrea tridentata) at the base of the largest saguaro (creosote clones can be thousands of years old) and the cholla cacti (Opuntia) in the foreground.